If you are searching for best rooting apps for Android Phone in 2019, it means you already know that the Phone rooting apps what can do in your phone. A good rooting app can do root your Smartphone without breaking the Android OS. There are many Android Rooting apps available that can root your Phone without having a PC or Laptop. But many of them can not root every phone correctly and sometimes even spoil the phone’s software. So If you’re still not aware, which app will work best on your Phone. Understanding your problem, here I’m sharing 3 best rooting apps here that can root your phone with or without a computer. Disable System apps to speed up the Phone. Helps to do full root level backup. Move all apps to SD Card. Helps to Remove ads from apps. This a most popular software for rooting any Android smartphone, It can root almost all android devices that running on 2.2-Froyo, 2.3- Gingerbread, 4.0 -Ice Cream Sandwich, 4.2 – Jelly Bean, 4.4 – KitKat, 5.0 – Lollipop, 6.0 MarshMallow, 7.0 -Naught and also it will support all newer Android Operating Systems (OS) that will launch in the future. You can check full supported Smartphone list here. It has lightweight APK file, which doesn’t consume much space on your Phone. In the third place, I always prefer to use Kingroot. It also offers Rooting tools for Windows and Android. So you have two easy options same as the Kingo Root app. 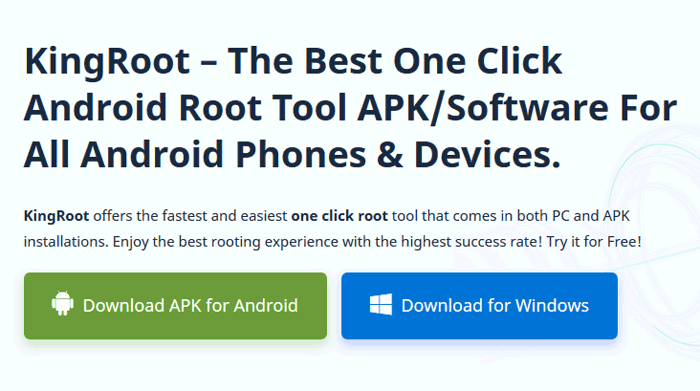 KingRoot offers one click root functionality in both Windows and Android apps. Therefore you just need to install the app and click on the one button to immediately root your phone. KingRoot currently supports more than 100000+ the Android devices including World leading Samsung, LG, Huawei, Google, and HTC Smartphones. So you can also try this app before using other Root apps. 5 Best free Call Blocker apps for Android Smartphone. Here I have shared those Rooting tools that I personally use and never faced any problem to till date. So you can try these free Android Phone Rooting and unrooting tools before using others. I have a Lenovo k8plus and it was updated to Oreo..I want to root this device but I couldn’t find any root app working in it . Kindly sujjest if any is available there .. thanks in advance..
Have you tried above 3? I tried 10 times 2 root my Android with KingoRoot but neither KingoRoot nor King Root will root my Android. But thank you 4 the info. Google Play Services requested a data connection 3,426 times in 48 hours. Google Play Store requested a data connection 726 times in the same 48 hour period. Along with a few other apps to a lesser degree. Without root, I cannot stop whatever spying Google is up to on a consistent basis. This is the real reason they hate rooted devices, because they cannot fight apps that stop them on a system level. I can unroot, update and reroot in about 2 hours. Plus, I enjoy full customization, full image backups (Thanks TWRP!!! ), systyemwide ad blocking, no bloatware, Viper4Android, and free Wi-fi tether. Without root, it’s the manufacturers’ and Googles’ device. with root, it’s mine. Who would buy a computer without full admin rights? If I wanted to simply take what someone gives me (While I pay for it), no questions allowed, I would just get an iPhone. A beautiful, clear, easy to follow article Pramod, and I Thank You for showing others what’s behind the curtain!!! Thanks for sharing this valuable info. It would very helpful to understand Why we need to root our Android Phone.